My last update for 2010!!! As I write this I find myself reflecting on the year as it is about to close out. We certainly have been faced with challenges as my job now takes me out of the country every other month. Life at Hidden Creek Horses goes on with Devon and Roger at the helm ensuring all 4 legged animals are happy, healthy, and in work. Not a small task considering we have 4 plus 1 (Petie). 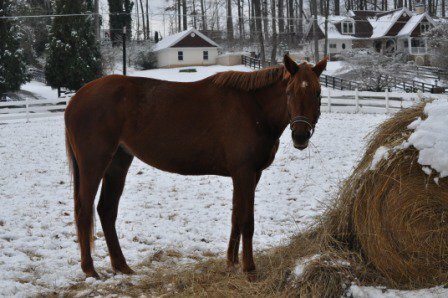 At one point we had Violet (a TB/TK cross in foal to Art) also on the property. Surprisingly everybody settled in and other than the extra effort with 5 horses, things carried on as normal. 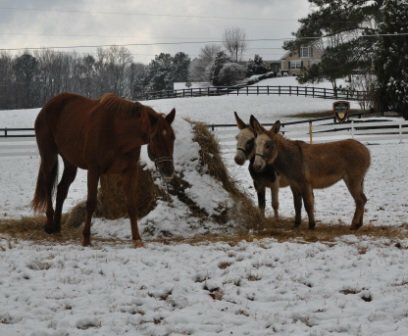 Violet is now with our good friends and partners living with thier Donkey, Splash, and our recently purchased Donkey Jeff! Wishing everyone a wonderfull New Year!!! AECs have come and gone. I am out of the country again and Devon is working really hard keeping everyone going at home along with starting her first year at Community College. Here is a video link to Art's outing at the AECs. It was a solid performance in the Preliminary Horse division against the professionals. Same XC track as the May show, but no time this outing resulted in double clear XC. Dan's heals were sore, so we pulled him after dressage. Not worth it. He is feeling really good after some time off. Next up Tryon and Chatt Hills. NAYRC in July once again was a bit of a bust for Devon, but she stuck with it and helped her team win Gold. As usual, with a "rough" event we learn valuable lessons and strive to improve and come out stronger. I think that is the case for the two of them. Art had a well deserved three month break from competition. He spent a lot of time lazing in the pasture and many trips up to Shannondale Farm to see his buddy Dave Shannon and his girlfriend the Phantom. All this must have agreed with him as he came out the last weekend in August a stronger and more mature contender and won his Open Prelim division at Full Gallop Farm, 15 points ahead of the second place finisher. Breeding is complete save for one mare that will be covered sometime in September. Nineteen mares are confirmed in foal, with 11 of them purebreds. Next spring will be very exciting!! All twelve 2010 foals arrived safe and sound. We have been able to track most of them, and it is evident that Art has been stamping his foals pretty consistently with a nice top line, and very correct conformation. He is also certainly homozygous grey, with all of the foals to go grey including Celtic Mark, the stunning grey and white pinto colt out of StarMark, an Art Deco great grand daughter. Now that I am working a 28/28 rotation, our competition calendar aligns with my months off. We have one more competition before I leave again (the AECs) and we will be able to squeeze in two more events in October and that will likely be all for the year. Good luck to all going to the AECs. Just a quick update - Dan is doing well after a month of relaxation following the Florida International 2*. Lush grass and occassional rides makes for a happy, plump Irish horse! Next up for Devon and Dan - Blue Hill Farm (Missy and Jessica's). After graduation of course! Then on to Young Riders in Kentucky. Donna and Art did the Chattahoochee Hills CIC* and finished in 2nd, less than a point out of first. Toughest show jumping yet. All the upper levels seemed to struggle with the footing, but the Prelim and 1* divisions especially had trouble, with only 4 clear rounds out of about 25. The facility is absolutely gorgeous and it is not even complete yet. It is a great venue, and the AECs should be pretty amazing. Breeding season is continuing with over 15 bookings. The next couple of months will be very busy. Seven purebreds are booked which will be very exciting come foaling season next year! What's next? Some well deserved rest for Mr. Art, and then I think in June we will do a dressage show at Poplar. Would like to qualify for the Area Champs at Third level. Just need one more score I think. We are so bored with the Prelim eventing dressage tests (basic first level) so it will be fun to get back to half pass and flying changes. 3 FILLIES AND 3 COLTS SO FAR (correction)!!! March and April competitions were up and down with Devon having a great showing at Southern Pines finishing 3rd in her Intermediate division and Donna having her first horse and rider fall on XC; in the water no less. They redeemed themselves in the Florida International CCI* by finishing 3rd on their dressage score. Breeding season is fully upon us with a very large booking of mares. Foaling of the 12 outside mares bred last year is in full swing with 6 babies on the ground; 3 fillies and 3 colts. It is very hard to focus on work this time of year when I get emails announcing births and others letting me know their mares are ready to be bred or their mare is checked in foal....It is so exciting and I absolutely love it!! I feel bad about not getting around to updating the website and once again will focus on the news page and update the Competition Results page later. I don't know where to start it has been so long...since October I believe! The Young Riders competition took so much out of us over the summer, that we really didn't do much in the fall. A dressage show and the horse trial at the Florida Horse Park in November, and that was really all we did. When I looked at the USEA results page for 2009, I realized that Art had only done 4 recognized events the whole year! 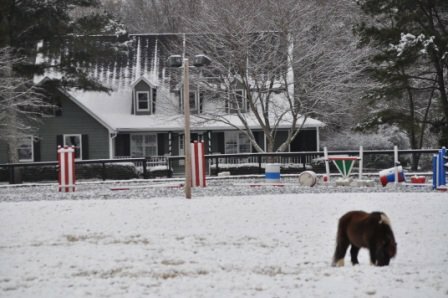 We have always wanted to spend time in Florida with the horses in the winter, so we decided to try to make it happen this year. I had some out-of-town trips planned for work, but no international travel, so figured we were safe to plan on leaving Dan and Art with Missy at Longwood (Ocala) for two weeks and doing Rocking Horse and Ocala Horse Trials. Rocking Horse did not go well for Art and I. I was so focused on various assorted other things, that ended up having a horrible show. The good news is that it was a wake-up call for me and I needed to get my head in the game and start riding better. Spending two weekends with Missy did a world of good for us and we went out at the Florida Horse Park and won the Prelim Rider Division. Devon had great shows at both venues, placing third at Rocking Horse in Open Intermediate, and winning the Intermediate Rider Division at Ocala. We both have our sights set on the Ocala three day event in April. I decided it was time to give Art an opportunity to really show his stuff in Open dressage competition and left him with Missy Ransehousen for a month so she could prepare him to do back to back dressage shows in Wellington. Missy's mom, Jessica was there for part of the time, and between them, they honed his dressage skills at 3rd and 4th level in preparation for White Fences and the Palm Beach Dressage Derby. Art was entered in 6 classes, all Open divisions against top professional riders and their warmblood mounts. Art and Missy won three classes and placed second in two of the classes. Three of the scores were above 67%, with one score of 69.2% The added bonus for me was that in between the dressage showing I was able to take show jumping lessons with Holly Mitten in the most beautiful surroundings of Wellington!! It was a tremendous experience for all of us, but am very glad that Art is back home now. Saffario was sold in February and will be ridden by Sydney Conley Elliott. I am so excited to see him with such a talented young rider. Look for the two of them this year - they will be one to reckon with!! We also found out that Delite, the mare owned by Phoebe and Brooke Drury who had a lovely part bred filly by Art last season did in fact settle when she was bred last year and she is due early April. So, Art did in fact settle all mares that were put to him, and we are anxiously awaiting to hear from 12 mare owners this season!!! !